Internet Genealogy - 04/05 2019 » Download PDF magazines - Magazines Commumity! 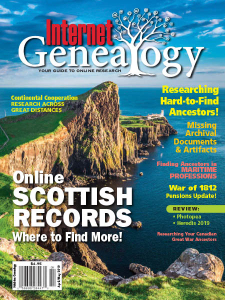 Internet Genealogy is a magazine that focuses on keeping today's family historian up-to-date with the vast and ever-growing collection of genealogy-related resources, software, tools, products, technologies and more. With each new issue you will find website reviews, social networking strategies, as well as tips, and stories from a wide variety of seasoned professional authors who share the benefit of their many years experience of doing traditional and online genealogy research.